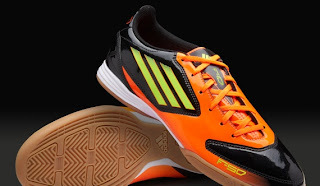 The adidas F10 Indoor Trainers is constructed from light synthetic upper which is easy to clean and provides the perfect combination of speed and outstanding ball feel. The variable width lacing system is off centre and follows the natural contour of the foot to provide a better anatomical fit and feel to the adidas F10 . 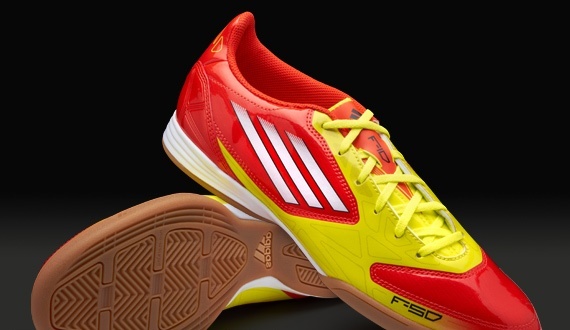 A Die-Cut EVA insole provides the adidas F10 Indoor Trainers with comfort throughout the duration of the game, no matter how long it lasts. A pre moulded EVA midsole with ADIPRENE insert in the heel improves shock absorption resulting in better comfort. This version of adidas F10 has a non marking indoor tooling for durability and excellent traction on all polished indoor surfaces.